South Portlander Lingdong Bol tied for third in the high jump with Windham's Alexis Wintle. 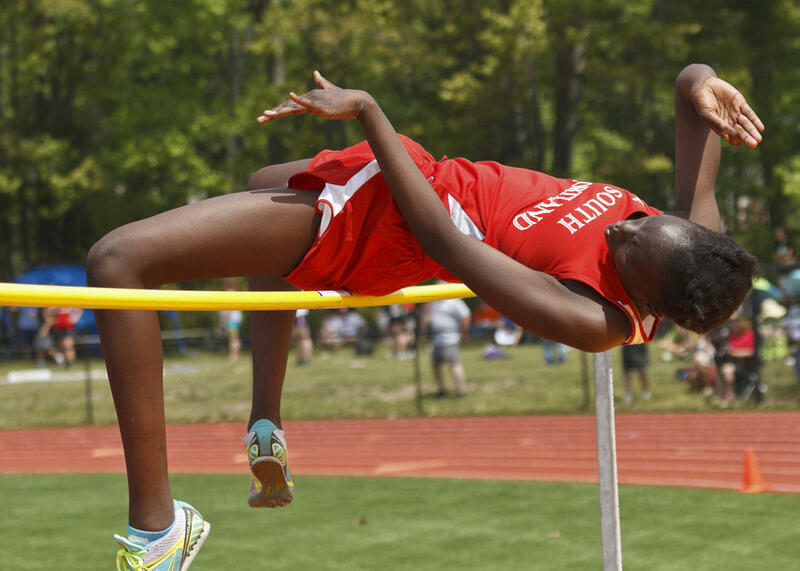 Thornton Academy played host to this year’s Outdoor Track Southwesterns. On the boys’ side, Scarborough amassed 112 points for a clean win over South Portland and Deering, who shared second at 75. On the girls’ side, Westbrook and TA tied for victory at 73 points apiece, while Bonny Eagle finished third at 72 and Cheverus fourth at 71. Blistering heat may have thrown many athletes for a loop, siphoning off their energy and rapidly dehydrating them, but standout feats still abounded. 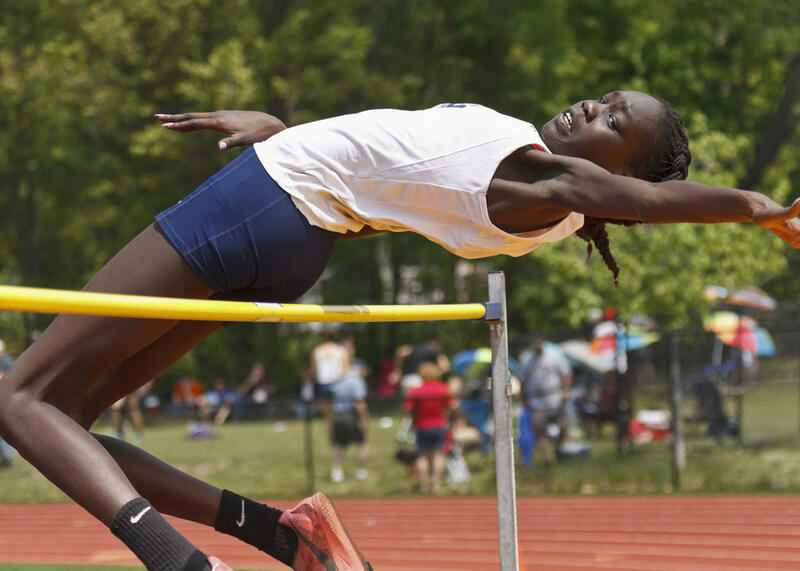 South Portlander Lingdong Bol tied for third in the High Jump with Windham’s Alexis Wintle. Gorham’s Luke Gowen finished fifth in the Long Jump. Megan Knights of Windham competes in the 100 Hurdles on Saturday. South Portlander Noah Blake finished fourth in the 100. Westbrooker Noah Knapton took 10th in the Mile. Nyagoa Bayak, not unexpectedly, took the High Jump for the Blue Blazes. Roray Sullivan of Windham clears the bar in the Pole Vault on Saturday. South Portland’s Ruay Bol splashes down in the long jump finals, which he ultimately won. Scarborough’s Sam Rusak finished second in the 110 Hurdles. 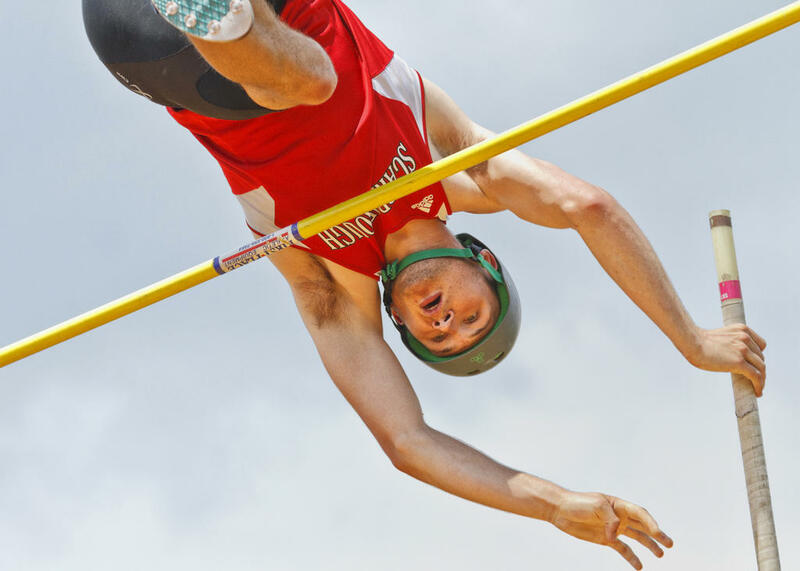 As expected, Scarborough’s Sam Rusak won the Pole Vault, setting a new meet record in the process. Gorham’s Sarah Stevens competes in the high jump on Saturday. Westbrooker Shammah Gahomera finished third in the 110 Hurdles. Bonny Eagle veteran Kialeigh Marston competes in the 4×800 on Saturday. Westbrooker Josh Lombardo took third in the Mile. Alexis Wintle finished eighth in the Long Jump on Saturday. Bonny Eagler Amy Beaumier tied for first in the Mile on Saturday. South Portlander Callie O’Brien finished third in the 100 Hurdles. Callie O’Brien took seventh in the High Jump on Saturday. Westbrooker Dominic Creenan took fourth in the 110 Hurdles. Elisabeth Redwood of Bonny Eagle won all three of her events on Saturday, including the 100, pictured here. Scarborough’s Ellen Shaw won the 100 Hurdles. Windham’s Ernie Ruby won the 100. South Portland’s Gary Maietta finished 12th in the Long Jump. South Portland’s Jake Maloney finished fourth in the Mile. Jamiyae Mattress of Scarborough hit 4-06.00 in the high jump. John Giberti finished 14th in the Mile on Saturday. Scarborough’s William Onorato finished middle-of-the-pack in the Mile.